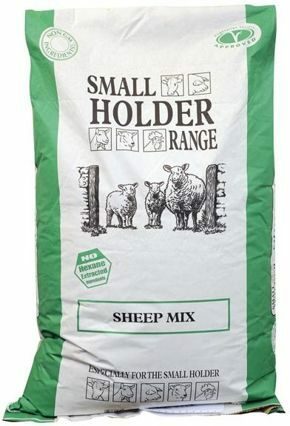 Sheep Mix is a quality all-round maintenance mix suitable for ewes, rams and lambs from 5 weeks old. Grass, hay or silage will form the basis of the diet. In winter you should allow 2kg of hay each per day for adult sheep. Additional hay may also be necessary in dry summers when grass is limited. Make any changes slowly and introduce concentrate feed gradually. It is usual to split the total amount into two or three feeds. Maintenance – adult sheep will usually need up to 0.5kg of Sheep Mix or Ewe Nuts per day. Ewes – after weaning – ewes should be monitored and not allowed to become over fat. Those in poor condition should be given Ewe Nuts or Sheep Mix, with quantities gradually increasing prior to tupping. Start with about 0.25kg per head, per day two weeks before tupping, and build up to 0.5kg, tailing off again after tupping. Feeding extra nutrients is essential if grass is limited. Ewes – Lambing – ewes will usually need to be fed Sheep Mix or Ewe Nuts from six to eight weeks pre-lambing, and certainly in the four weeks before, when unborn lambs are developing rapidly. Introduce feed at 0.25kg per day and build up (to about 1.0kg/head/day) over the weeks before lambing. Be careful not to overfeed, especially young ewes or those lambing for the first time. Ewes – during lactation – the ewe’s energy requirements will be greater than when she was pregnant. If lambing early, supplementary feeding of hay or straw, and up to 1kg of Sheep Mix or Ewe Nuts per head, per day, will probably be necessary throughout the first four weeks after lambing and can then gradually be reduced over the following two to four weeks. Lambs – Start lambs on Sheep Mix or Lamb Starter/Grower from the age of about seven days. Offer small amounts of feed for them to pick at, as well as good quality hay. This can gradually be increased so that by the time they are weaned (usually at about three months) they are eating at least 0.4kg of concentrate feed a day. In late season when grazing is limited, Lamb Finisher can be fed at up to 1.0kg per head per day. Rams – may be fed Sheep Mix at up to 1.0kg per head per day.